On this day, February 8 of 2011, he would’ve become an octogenarian. Live fast and never die, Jimmy. 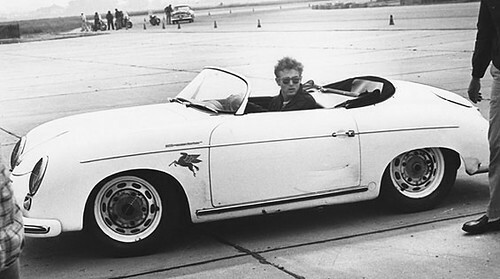 Born in Indiana, James Dean lived in Los Angeles from the time he was 4 until he was 9. When his mother died, he rode the train back to Indiana with her remains and lived in the hamlet of Fairmount with an aunt and uncle until he graduated high school in 1949. A few days later, Dean was on a bus to rejoin his father in California. James attended Santa Monica City College and transferred to UCLA to study drama. In the spring of 1951, he went to New York where success on Broadway brought him back to L.A. early in 1954 to make his first movie, East of Eden. With some of his Eden money, James bought a used MG TD, the most popular sports car of its day. By early 1955, about to make his second film, Rebel Without a Cause, Dean decided he wanted to go racing. He purchased a Porsche Super Speedster from dealer John von Neumann. The model was only recently introduced and was the hot setup for the under-1500-cc production class. Speedsters were in short supply, and Dean’s celebrity almost certainly moved him to the head of the waiting list. James’s private personality was much different from the on-screen Dean. He was very methodical in his approach to reaching goals. In high school he’d done well in debate. He’d also won the Indiana section of a National Thespian Society contest, and went on to finish sixth nationally. He approached racing in the same calculating way. Within 10 days, he put 1000 miles on his Speedster, much of it on Mulholland Drive, where difficult curves on the coastal range crest were a breeding ground for would-be racers and some real ones as well. ~ by velofinds on February 8, 2011. That Mobil Oil decal behind the front wheel is ridiculously cool. innit? love the no-hubcaps look also.